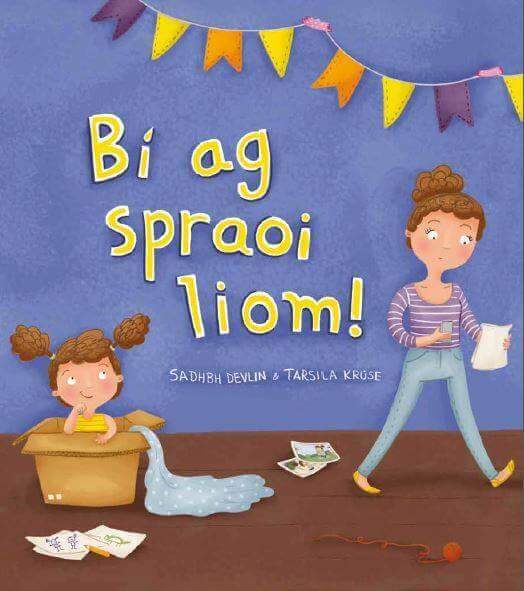 Leabhair scríofa ag údar Sadhbh Devlin - Bí ag Spraoi Liom! Is cumadóir iontach í Lúna le fadhb mór amháin; tá Mamaí ró-ghnóthach bheith ag spraoi lei ina Measín Ama nua. An féidir le Lúna plean a cheapadh le Mamaí a mhealladh le spraoi lei? Tugann Bí ag Spraoi Liom! meabhrú dúinn am a dhéanamh do na rudaí is tábhachtaí sa saol. Lúna is a keen inventor with one big problem; Mom is too busy to play with her in her new time machine. Can Lúna find a way to help Mom make time to play? Bí ag Spraoi Liom! is a book which reminds us to make time for the important things in life!